Elizabeth Burns: You Have 48 Hours. How many books can YOU read? 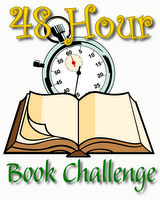 Yes, it is MotherReader's Annual 48 Hour Book Challenge. Can you believe it's the 4th year already? 1. The weekend is June 5–7, 2009. You pick your 48 hour window. 2. Books should be 5th grade level and up. 3. The length of the reviews are not an issue. You can write a sentence, paragraph, or a full-length review. The time spend reviewing counts in your total time. 4. On your blog, mark your start, with a final wrap up on Monday that includes number of books, number of hours.